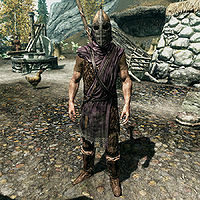 Ivarstead Guards are special Stormcloak guards that can be found at Ivarstead. If the Rift is conquered by the Imperials, they will all be replaced with Imperial Guards. 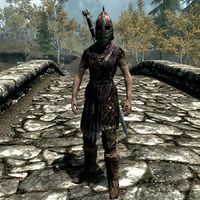 They are all clad in Riften guard armor, a matching helmet and shield, and a pair of fur boots. They are armed with a hunting bow with 15 steel arrows, a steel dagger and either a leveled mace, sword or a war axe (all three variations will be iron quality at level 1-3 and steel quality from level 4). Additionally, they have a 50% chance of carrying a torch and a slim chance of carrying some food, drink or an amulet. Two guards patrol the southeastern part of town, from the bridge to the path leading to Shroud Hearth Barrow. Two guards patrol the northeastern part of town, from Fellstar Farm to the bridge leading to the 7,000 steps.